The city of Amarna was a 17 year period of change and drama in Egypt’s ancient history. It was established as the capital city of Egypt in 1353 BC during the late 18th dynasty by Pharaoh Akhenaten. 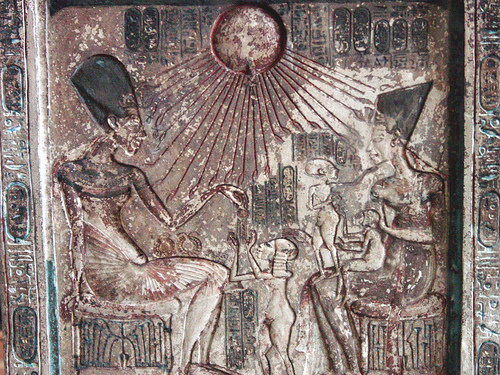 He founded the city on virgin land in order to be ”seat of the First Occasion, which he had made for himself that he might rest in it.” His goal was the creation of a site dedicated to the worship to the Aten. Amarna became home to the majority of Egyptian government and nobility, as well as officials, soldiers, servants, and laymen to provide for this new city. When Akhenaten died 17 years later, the city was for the most part abandoned until the Roman period. Due to this, its internal plan is the most well preserved for Ancient Egypt. However, because of its unique construction it is debated whether this is representative of an Egyptian city. The site has unique art that is of a more realistic style, and is the only ancient site dedicated to monotheism. In 2005, survey and excavation began of the South Tombs cemetery. The study of the human remains and burials offers new insight into this the 17 year period that this distinct and unique community existed. The cemetery is located southeast of the main city site. There are two sections to the cemetery including earthen burials and rock-cut tombs which were unfinished. The site is estimated to contain thousands of burials, 222 have currently been excavated, and from this 274 skeletons were recovered. The burial rites were both simplistic and consistent, with simple oblong cut graves in parallel lines. These were marked by low cairns of limestone, some of which had memorial stela or mini pyramids. Grave robbing had occurred, though the remains themselves appear intact. The deceased were laid out in an extended, supine position, wrapped in textile within a burial container of wrapped plant based mats. Wood and pottery coffins were also found, but these were rare. None were mummified, though some hair did survive. Very few grave goods were found, though there were some offerings of food and drink found with the burials. Traditional analyses of the burials and grave goods to determine social roles and status do not apply well to this cemetery. The sand does not allow for approximation of grave size. Grave robbing of artifacts means that analysis of grave goods cannot be done to determine status or affiliation. Further, the cemetery lacks clustering or other possible spatial indicators of family or group relations. The skeletal remains of individuals with high preservation were studied further to determine lifestyle. These were taken from the cemetery site and consist of the working class. This sample includes 95 adults and 64 subadults. When compared against other sites in Egypt, the adults at Amarna are slightly shorter, potentially indicative of poorer nutrition during childhood. Cribra orbitalia, porosity in the upper portion of the eye sockets, was found in both sub-adults and adults suggestive of iron deficiency. A further 8 sub-adults have porosity throughout the skull indicative of scurvy, a vitamin C deficiency. Workload in adults can be determined by degeneration of the joints, trauma, and pronounced muscle markers. Of the 95 adults examined, 71 show signs of degeneration in their joints, especially frequent in the spine. The intense workload of quickly constructing a new city is evident on these remains. Over half also show signs of trauma especially within the vertebrae, a sign of the intense workload and heavy lifting. The skeletal remains provide a unique counterpoint to the portrayed opulence and prosperity displayed in art and written about on the city and temple walls of this area. Egypt was prospering during this period, and the capital city had the benefit of being supported by taxes. Despite this, the skeletal remains of the working class show a life of hardship and severe stress, both physical and nutritional. Amarna is a unique site, and therefore must be approached both on its own and as part of the broader history of Ancient Egypt. While the history and goal of this site have been known for years, specifically that it was meant to be a haven for the worship of Aten, the archaeological evidence is showing that it wasn’t quite the ‘eden’ that it was made out to be. Elites continued to worship and pray to multiple gods, they continued to discuss the afterlife of their ancestors, and the health of the working class reveals that not everyone received the benefits of this prosperous era. The study of this site will be problematic and must be approached carefully, but it is fantastic to finally be learning more about this unique city.